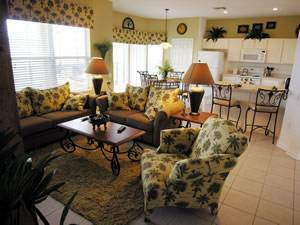 Located in beautiful Windsor Hills Resort, our Disney Area Vacation Rental luxury sytle homes are only 2 miles from Disney!! 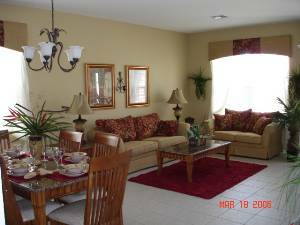 Our homes offer six bedrooms, four bathrooms and are professionally furnished and decorated. 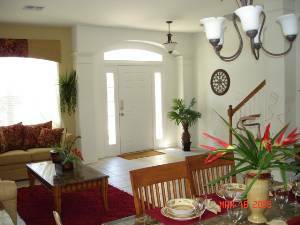 Offering 3000 sq ft of living space, a Lanai overlooking the private pool and spa, a large family room, living room, dining room and kitchen with full amenities. 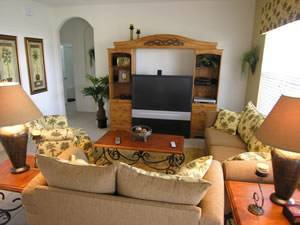 The Family room has a 52" TV and Playstation 2 and each of the 6 bedrooms have a private TV with cable. 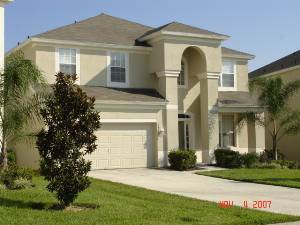 Windsor Hills is a 5 star Resort Vacation community only 2 miles from Disney World. The resort offers a world class pool complex with slides, water fountains and Spa. Windsor Hills resort offers an onsite movie theatre, gift shop, snack shop, fitness center, Tennis, Volleyball, multiple playgrounds. New furnishings throughout the house and professionally decorated. Includes a 52" Television in Family Room along with Playstation 2. Each Bedroom as its own private cable television. Disney Theme Parks, Seaworld and Universal Studios. 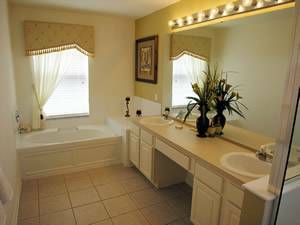 Featuring King Bed, Television and private bathroom with tub and shower area overlooking his and hers sinks. We just got back from a weeks stay at the Windsor Hills Resort. The home we stayed at was outstanding. 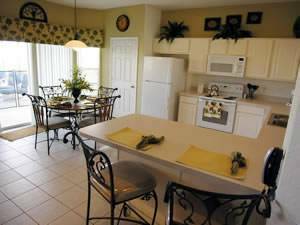 Plenty of amenities and very close to all the theme parks. The community had tons to offer for everyone in our group. I would recommend this resort to anyone. The only downside was not being able to BBQ. We purchased a small grill and left it in the house for future guests. I hope this isn't a problem. Again thanks for a wonderful stay and we look forward to another visit next year. Deposit: $275.00 deposit required. Balance due 30 days prior to check-in. Cancellations and Refunds: All cancellations must be received in writing and are subject to the following penalties: 30 days or more before arrival date = $275.00 non-refundable deposit. Less than 30 days before arrival date = 100% non-refundable charge of total cost. No refunds for early departures. 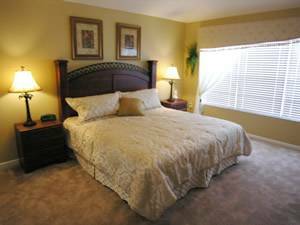 Other Fees: Optional Pool & Spa heating $30.00 per night.